to illustrate the outdoors pages of the newspaper. My artwork has been recognized throughout the United States. 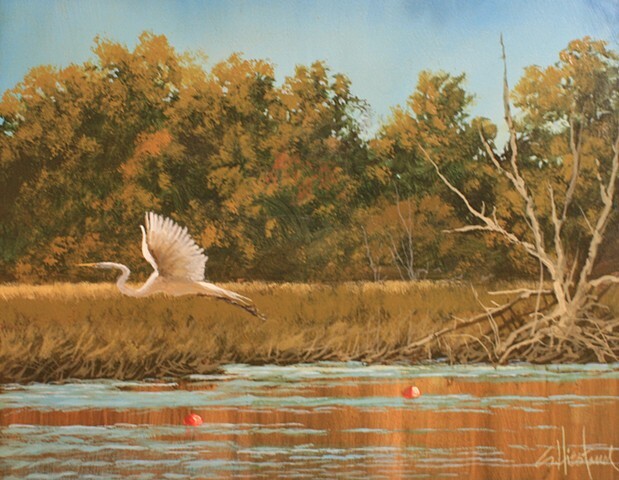 I was the winner of the State of Indiana upland bird contest with an acrylic painting of a wild turkey; had works selected for the Paint America National Gallery tour; designed the Florida bass fish automobile license tag; and was recently the over-all winner (June/July) for the Plein Air Magazine Salon Contest. My work is in many private and corporate collections, including the Daytona Beach Museum of Arts and Sciences, the Florida Game and Freshwater Fish Commission in Tallahassee, the College of Central Florida, Ocala, and many others. While I take part in several favorite outdoor art shows each year, I have evolved primarily into an avid plein air painter, working solely in acrylics. I enjoy working in the Florida outdoors attempting to capture the mood and the ever-changing light that surrounds me. I also enjoy the many great conversations I have with people who stop by to view a painting in progress. In addition to my paintings, I also create various bird and fish sculptures using wire and various finishes. When I'm not painting, I enjoy the sport of falconry. This activity puts me in the heart of nature-- my favorite place to be. I hope you enjoy my work on this website and that you will check back often to view my new works or to find out where I will be painting next. Please feel free to drop me an e-mail at scotthiestand@aol.com with any comments or questions.